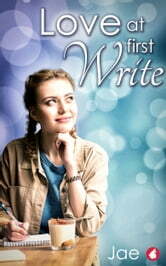 Award-winning author Jae penned four romantic short stories about heroines who are writers. From a reporter being challenged to write a romance to an author on a blind date in a bookstore, these short stories are guaranteed to have a happy ending. Reporter Abby James prides herself on never having read a romance novel. She thinks they’re formulaic, shallow, easy-to-write drivel—until romance author Tamara Brennan challenges her to write one. Is it possible that Abby will find the outcome of that bet not so predictable after all? Lesbian mystery writer Mara McKinney has had a crush on her editor, Hayley, for ages, even though the two have never met face-to-face. When Hayley calls her to suggest she introduce more romance into her novels, this might be Mara’s chance to work on her own happy ending. Like most cats, liger shifter Griffin hates winter…until her human mate Jorie asks her to help with the research for a love scene she’s trying to write. Even though Tricia pens lesbian romances for a living, she hasn’t been out with a woman in forever. Her best friend sends her on a blind date in a bookstore, but the woman she meets in the LGBT section isn’t who Tricia thinks she is. What will happen when the wrong date turns out to be just right?